2009 was an amazing year in the fitness industry as millions of men and women finally lost body fat thanks to powerful programs like Turbulence Training, P90X, and Kettlebell Workouts. In fact, I’d say that “Short, burst workouts” were the *program of the year*. The year also made history because of the popularity of “contrarian” diet programs, such as fasting and cheating for fat loss. Each of these nutrition plans also helped thousands of men and women to be less obsessive with their daily nutrition – gone are the days of weighing your food and stressing about every calorie we consume. I’m happy to see these two approaches become more popular. So what does 2010 hold for fitness and nutrition? Well, you’re about to discover my Top Ten fitness predictions for the upcoming year. So sit back, grab yourself a Green Tea, and join us as we predict the future of fitness AND give you dozens of new workout and diet tips to help you lose fat and sculpt your body faster than ever in 2010. Meatheads, get ready! It’s time to crawl back out of the caves and be loud and proud of your desire for bigger arms, a more muscular chest, and yolk-like traps. Generally when there is a movement to one extreme, we always see the pendulum swing back the other way. And in the past 5-10 years, bodybuilders have been like Rodney Dangerfield – they ain’t gettin’ no respect. So this should be the year it all changes. Flex magazine sales will probably go through the roof, more guys – and gals – will be caught curling in the squat rack, and it will be *okay* again to be called a bodybuilder. On the bright side here, these new programs will satisfy our guilty pleasure desires for pump-type workouts – hey, there’s a time and place for everything! Speaking of the pendulum swinging back the other way, we’re going to see trainers hyping up cardio again…but it doesn’t bother me, and frankly, don’t let their claims get your hopes up. Even though new cardio machines, more cardio articles in magazines, and possibly even aerobics classes will get promoted hard-core this year, the truth is you can’t ignore the research and results – interval training and metabolic resistance training will continue to dominate when it comes to fast fat burning. This will be the nutrition trend of the year. Now I honestly don’t expect millions of men and women to become vegetarians overnight, but I do expect that 20-25% of folks seriously interested in their health and fitness will adopt a vegetarian eating plan for at least one day of the week. In 2010 more and more meat-related food illnesses will occur, and healthy eaters will finally realize that mass-produced meat – even the stuff from *healthy* sandwich-franchise restaurants can’t be that good for you. In addition, more healthy eaters will discover the strain on resources that comes from producing excessive amounts of animal protein, and more and more celebrities and fitness experts will prove to their fans and readers that a beautiful beach body can be achieved with much less animal protein (including whey shakes, burgers, eggs, and steaks) than previously thought. At the same time, there will be a wise and continued shift among healthy meat eaters to go the extra mile to get locally produced and grass-fed meats. Unfortunately, far too many people will remain uneducated about the dramatic reduction in the quality of animal foods and will continue to suffer health problems and obesity from fast food. 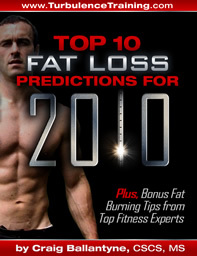 Click here for Part 2 of the 2010 Fitness Predictions. Don’t be surprised to see your favorite fitness experts disagreeing and even contradicting one another – remember that these are just predictions, and there’s no guarantee about who will be right or wrong. Get ready for dozens of new workout and diet tips to help you lose fat and sculpt your body faster than ever in 2010.